You have the weekend planned to a tee: go to the yard, muck out early and saddle up to enjoy a long, peaceful hack and add up some miles. But when the morning arrives and you peak through curtains, the sky is ominously grey. By the time you’ve pulled up at the yard the heavens have opened, wind is howling and your horse is giving you the look that says “not today”. It can be difficult to keep motivated to ride when you’re a leisure rider, but with a #Hack1000Miles goal to aim for, every mile counts — even in the winter. “You know it’s been a good ride when you come back looking like this!” laughs Cassi Errington. 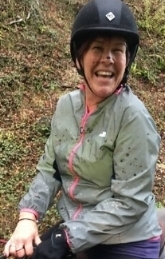 Who needs a spa treatment when you can be splattered by mud, for free, out hacking? Spook-proofing a horse at its best! Gillian Kedzierski avoided an unexpected dismount. 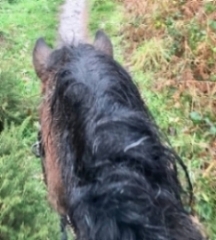 Shauna Fowles’ steed doesn’t mind getting his hooves wet! Shauna Fowles embraces flood water and all! 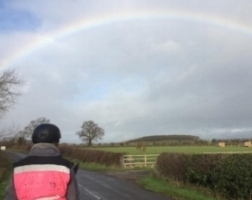 Sarah Granger and Joanna Holland experienced all the seasons on a recent ride. “We managed 8.9 miles in very confusing weather – sun, rain and wind,” says Joanna. 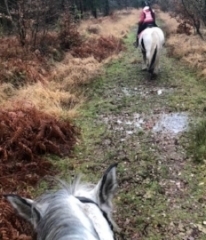 The result was a bit of a muddy hack – not that they seemed to mind too much. Sometimes it’s worth it to be brave and face the weather. And the reward? A beautiful rainbow!